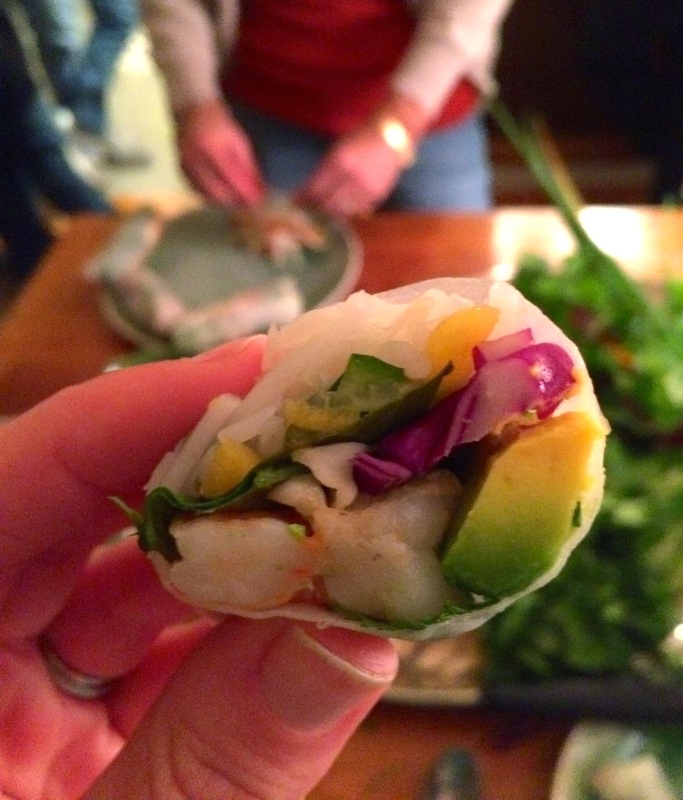 In the spirit of healthy living and continued celebrations in 2015, I gathered a few family members for an interactive summer roll-making party. 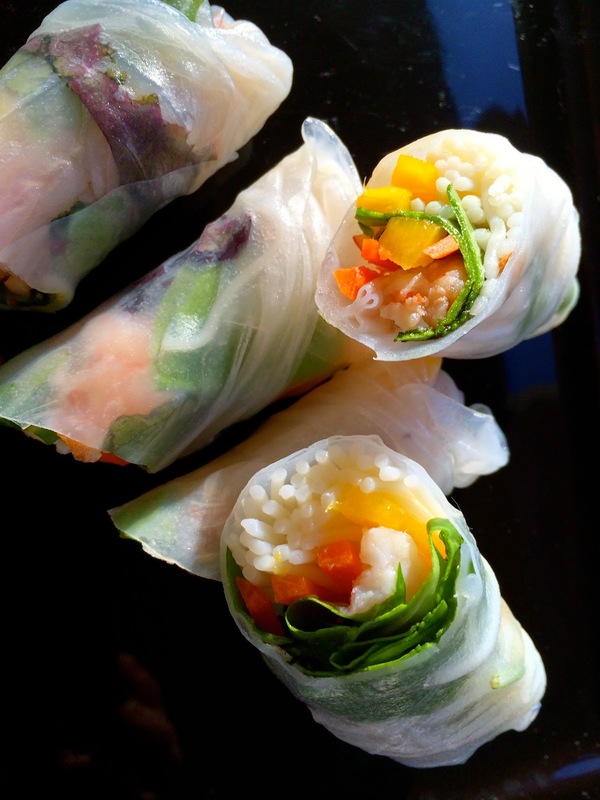 Fresh summer rolls are one of my all time favorite poppable bites and always provide a burst of clean, fresh flavors. 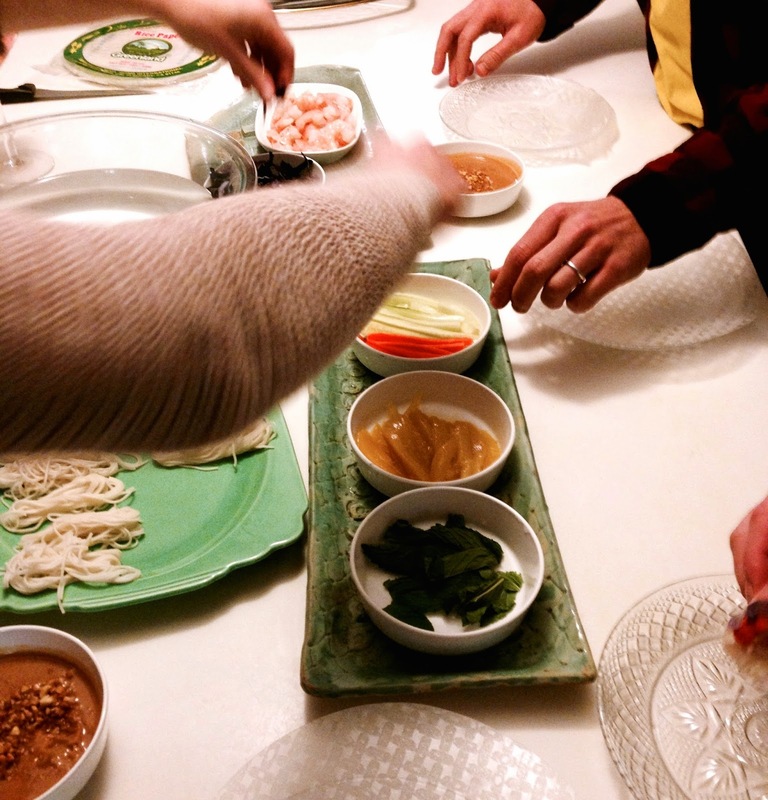 The Vietnamese version gỏi cuốn are steamed wraps filled with various ingredients like pork, shrimp, mango, cabbage, and Vermicelli rice noodles and are served alongside simple dipping sauces. I had never attempted to make the rolled wonders on my own, but Kara urged me to give them a try when she had the opportunity to learn how to make them from a neighbor from Southeast Asia. With shopping list in hand, I hopped across Mass. Ave. to my beloved Asian market, H Mart and grabbed the rice noodles and rice paper rounds. I prepared all of the filling ingredients including an array of vibrant matchstick veggies ahead of time and arranged them on small plates. I also set out soy sauce, Sriracha, hoisin and a spicy peanut sauce for dipping. Assembling our round rice paper canvases was a blast. The improvement from everyone’s first rolled creation to their last was staggering - even our brother James got the hang of it! While sipping cocktails, we quickly filled a platter with the soft, translucent rolls ready for dipping. They disappeared pretty quickly soon after. In a small bowl, stir together the peanut butter, soy sauce, and Sriracha. By tablespoons, whisk in the hot water to create a smooth sauce. Sprinkle with chopped peanuts and serve. Can be made ahead of time and kept in the refrigerator. Next, prepare the noodles according to the packet instructions. Drain, and run under cold water to cool. Fill a large bowl or deep plate with hot water for softening the rice paper wrappers. Put a rice paper wrapper on a plate in front of each guest. One at a time, dip one of the rice paper wrappers into the hot water. Allow the round to soak for 10-15 seconds until soft and pliable. Remove from the water carefully and set back onto the prep plate. Place 1 or 2 strips of each vegetable, a couple pieces of shrimp, a few sprigs of mint or cilantro, and a small handful of noodles on the bottom third of the wrapper (be careful not to overfill them as they'll be difficult to roll). Pull the bottom edge of the wrap tightly over the filling, and then fold over the 2 sides. Roll tightly from the bottom to the top until the entire wrapper is a cylinder. Cut in half, place on a platter and enjoy with the Spicy Peanut Sauce and any other favorites. 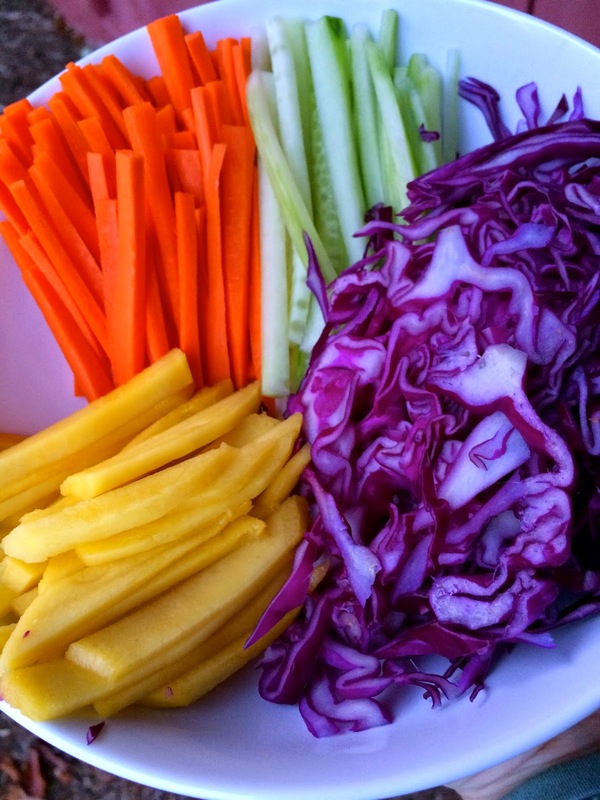 These fresh appetizers are not only addicting, they are nutritious too. They can be made gluten free, vegetarian or vegan. I think the next time I might try a dessert spin!